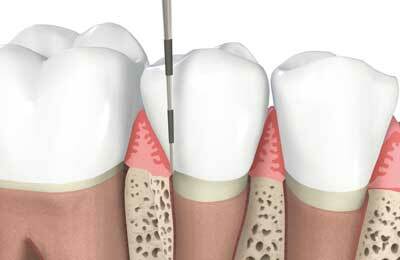 One of the most spread affections nowadays are periodontitis, often incorrectly called periodontosis. This affection is caused by periodontal bacteria that can affect single teeth or multiple teeth, causing an infectuous illness to the gums and jaw. This does not depend on age and can occur to different degrees on different teeth. Periodontitis is caused by bacteria between teeth and gums. If these bacterial stains (plaques) are not removed by diligent cleaning with toothbrush and dental floss, they can transform into the hard and tubercular calculus. With time, this will lead to redness, swellings and bloody gums. If not treated, the tissue unifying tooth and jaw will be destryed causing the bone to degenerate. Without this fixing tissue between tooth and jaw, the teeth will become loose and may be lost.